Anton Corbijn (website here) is originally a music photographer and a music video director; now, he's a painter of place, a filmmaker who demonstrates, in his new film The American, a truly intimate sense of setting. This setting, a small town in the Italian countryside, provides the uneasy core of his narrative, which is severe and spacious, barely the scraps of a plot draped over the solitude and exposure of his remote locations. 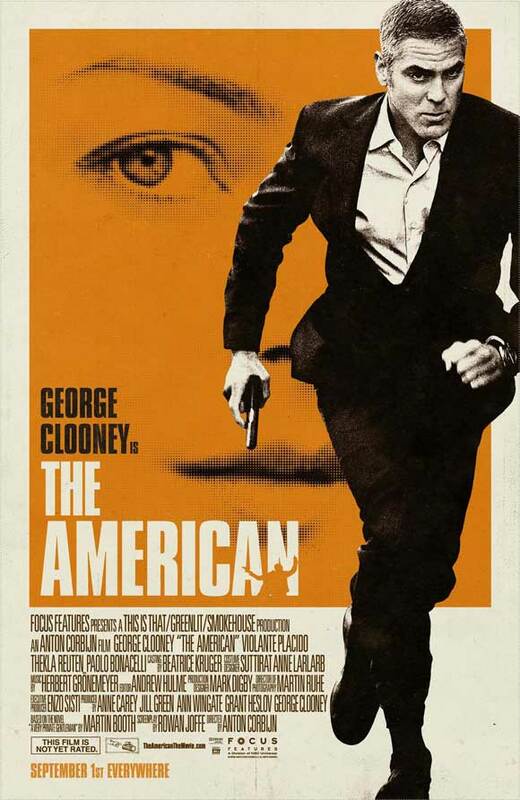 The American (played by Mr. Clooney) is alternately Jack, Edward, Mr. Butterfly, and Clark; in any case, he's a lonely freelancer in the employ of shady European double-talkers. He's stripped of history, his past only peeking through telling details: he's fleeing from a gang of swedes, and he seems fond of open-armed European brunettes, and he's obsessively paranoid. His employer keeps dropping hints that he's outlived his usefulness. He knows a lot about butterflies, and has a tattoo of one on his back. In light of these dim highlights of characterization, Jack becomes almost a formal construct, rather than a narrative one. He isn't given enough volume or detail that we feel we should try to decode him, or fill in his back-story; rather, like the subject of a photo, he's there to provide a focal point, a center of gravity for a story about a time, a place, and a mindset. It seems like Jack is paranoid, but he's not... the whole world is paranoid as it gravitates around him. It seems like he's stark and empty, but he's not; rather, he lives in an empty Italian countryside, in a vacuous world, where nobody (including his lovers and his associates) knows anything but the echoes of human contact. This is why this is a photographer's take on the thriller. This paranoid international neo-noir isn't about the intricacies of personal and political intrigue, like the classics... like a spy or a military fantasist would write. There's no sense of confidence, investigation, revelation, or betrayal, and the twists are devoid of explanation. I suspect Jack is not the primary target of the plot being hatched in The American, but ultimately, because of the way the film unravels, there's no way to know; it may have been all about him, or he may have been a wrinkle that his employer needed to smooth out. A photographer doesn't concern himself with these details... for Corbijn, who seems to be cherry-picking archetypes and images and set-pieces from the history of espionage lore, all the meaning resides in the surface, not in the enigmatic but irrelevant histories of these assassins. And so Corbijn does what a photographer does best: he choreographs a synchronicity between the subject and the setting. Clooney is framed and dwarfed by empty windows, and his car constantly appears as a flicker in the bottom corner of an epic landscape. In his first car-ride, a few minutes into the movie, he seems to disappear completely into a white fog, just as he vanishes from the sight of his pursuers. Jack is ruthlessly paranoid, always struggling to maintain awareness of the hiding places, the far corners, the twists and deformations in the landscape around him, and so, in many of the shots, we have to shift our attention from the foreground to the background, or respond to small visual and aural details. As we sense the tension created by the camera, especially in the back alleys of Jack's small town, so our gaze reacts more rapidly and our expectation heightens. Corbijn's awareness of the photographic nature of this, his second film, shows through in Jack's choice of photography as a cover story. And Jack sells himself as an architecture and travel photographer, further reinforcing the theme of geography, of the film's profound sense of place. This Italian town has a texture and a shape, a pervasive rhythm and dynamic, that compliments Jack's quiet, tense demeanor. Control, Corbijn's first feature, has a similar sense of time and place... Manchester is a desolate industrial backdrop for Ian Curtis's hopelessness. We get little sense of the social scene surrounding Curtis, but as a tableaux, Manchester seems to embody his state of mind. These are the virtues that somebody like Corbijn can bring to a film: the experienced lens to capture the space around a protagonist; the unique ability to create a strong main character from surface qualities. If Corbijn continues to use these talents to his advantage, and to refine his approach to narrative complexity, then film will benefit significantly from his contributions.